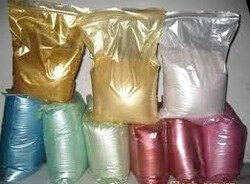 We deal in Colored Pearl Powder, which is widely used in paper and cosmetic industries. The Pearl Powder & Paste is formulated using the finest constituents. Our Pearl Powder & Paste is non-sticky and has fine particle size. We can make it available in different colors and textures. Contact us now to purchase Pearl Powder & Paste in different packaging options.